Reverse engineering using 3D scan data is the most efficient way to generate a 3D CAD model from a physical object that has any kind of complex or freeform shape. And 3D laser scanning is much faster and less expensive than traditional measurement techniques. Scan data can be turned into a model representing an as-built shape, or to match original as-designed features – including parametric ones. 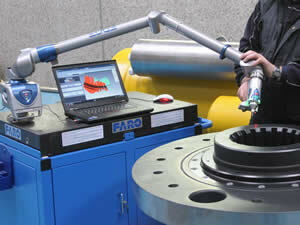 Or, 3D scanning can be used as the basis to create a next generation design by starting with an existing part. If your part is too large to be laser scanned or requires internal components to be scanned, we have access to a variety of other coordinate measuring (CMM) solutions, including probes, CT scanners and handheld color scanners. High speed 3D scanning has an unbeatable payoff –requiring about ½ the cost and less than 20% of time required in a manual process. Take the example of a moldmaker who needs to re-qualify used molds. Instead of using gauges and instruments to manually measure the mold’s dimensions and locations, PartWorks can take a 3D scan of each mold and perform detailed iterative inspections, then provide reports and final documentation that exponentially expedites the parts’ production. Do you repair aircraft engines or other high value parts using plasma spray or other thermal coating processes? Learn how PartWorks can use laser scanning and 3d printing to dramatically improve your masking process to improve throughput, reduce labor costs, and minimize part destruction. Learn more about leveraging 3D scanning and reverse engineering. Contact us today to discuss your needs or request a quote. CAIRE Medical faced a challenge. They needed to verify their capabilities to a customer, and they turned to PartWorks for help …Read More.